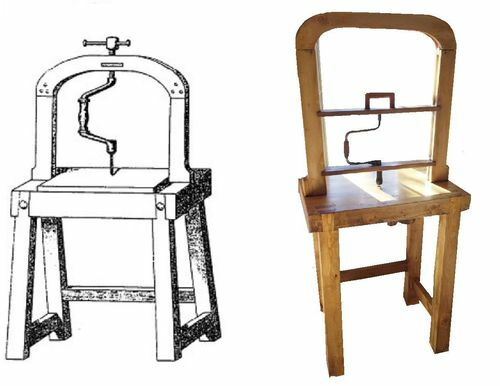 As you may or may not know, I recently completed a hand crank drill press inspired by a drawing of one reportedly depicted in Siever’s ‘Il Pianoforte…” 1868. I thought it only fitting to have a set of antique center bits to accompany my new/old drill press. Well, we all know these are had to come by. So, my next best option was to find something to emulate those wonderful old bits, and spade bits seemed like a logical solution. Most of the spade bits I examined though had rather small side cutters and the shanks were too long to fit my drill press comfortably. That is until I happened upon the Warrior Steel Spade Drill Bit Set #93723 from Harbor Freight. 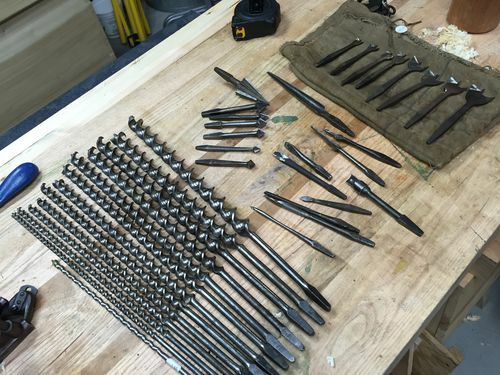 A 13 piece set consisting of bits from 1/4” through 1” in 1/16” increments, having short 1/4” hex shanks that securely lock into a hand brace. Although intended for use in a high speed electric drill the side cutters are machined with spurs that cut nicely at slow speed requiring very little downward force. I cannot speak as to the performance of these bits in an electric dill, as I do not own one. I can however say that they work perfectly in my hand crank drill press and at $9.99 are a welcomed substitute for the antique center bits. They really bore quickly, the trick being to either have a sacrificial board on the other side or finish the bore from the far side. As for the spade bits, i’ve never been happy with them outside of rough construction bores for electric or plumbing. As for the spade bits, i ve never been happy with them outside of rough construction bores for electric or plumbing. 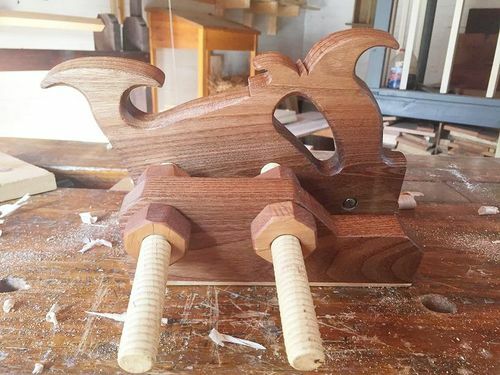 do you sharpen and/or modify the bit shape at all? AaronK – I haven’t had to sharpen them, yet … I’ve only had them for a few months. I imagine when I do I’ll maintain the same bevels. I might even try to increase the spurs a little. The center is wide enough to allow for many, many sharpenings. Would you be able to post a sample picture of a hole bored using one of these bits? My experience has also been they leave a coarse hole in softwoods using an electrix drill. Maybe its different by hand in hardwoods. Yes, I’ll take a few photos … unfortunately I read your post after sundown so will have to take them tomorrow afternoon … stay tuned! All with the same 11/16” bit … hope this helps! thank yoU! huh, what do you know. I may have to give these a shot in hardwoods and/or very low speed (i dont have a brace, only electrics). I see no reason to believe that this particular set is any better than any other in terms of sharpness, metal quality, or cutting profile… spade bits traditionally occupy the lowest shelf in terms of hole boring :) ie, they are all universally “bad” until now lol. 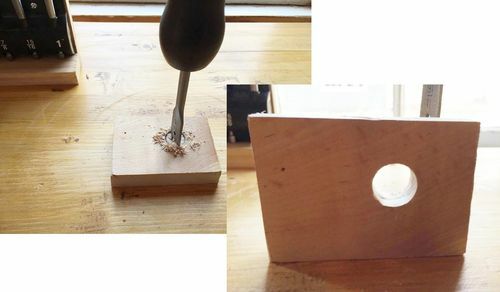 Aaron – Well there ya go … please know that these holes were bored part way through and attacked from the opposite side to finish and that for obvious reasons the maple took a bit more time and downward pressure. 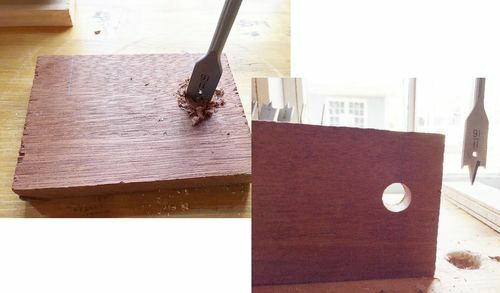 so i tried it myself and got similar results… i think the key is low speed at the start of the cut to define the edge, then finishing from the opposite side too. It also helps to use in a press, where a consistent angle can be assured. That’s basically the exact opposite from how these are normally used (fast with a hand drill at high speed, where they just totally tear up at the start then blow out the back side!). Well , I have to say thank you for giving my spade bits a purpose! 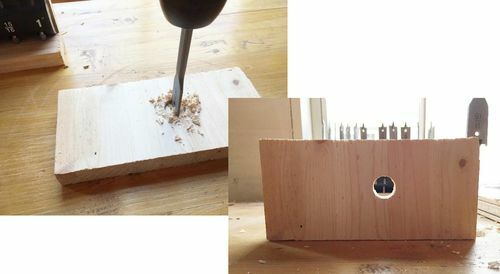 so i tried it myself and got similar results… i think the key is low speed at the start of the cut to define the edge, then finishing from the opposite side too. It also helps to use in a press, where a consistent angle can be assured. That s basically the exact opposite from how these are normally used (fast with a hand drill at high speed, where they just totally tear up at the start then blow out the back side!). Well , I have to say thank you for giving my spade bits a purpose! My pleasure … glad to help!